The Late Show, he caved in, I believe, out of misplaced fear that he might be banished from his late night throne. watched knew Letterman's joke was about the Palin daughter who'd gained national fame as an expectant teenage mother. and concerned a young woman who'd been much talked about in the national media regarding her youthful promiscuity -- a young lady whose fruits were paraded at the Republican convention and during the campaign by her ambitious mother. to an unnamed Palin daughter at the Yankee game. It was Sarah Palin, a two bit governor of one of our nation's smallest states and the bottom half of a failed presidential campaign, who, in her zeal to stay in the spotlight, jumped at the chance to get back at one of the many comic commentators who've previously enjoyed many jokes at her expense. And she kept repeating it and repeating it even well after Letterman -- in a smart move to quickly defuse the controversy -- clarified rather emotionally last week on his show that it was Bristol who was the gag's target. had all her facts in order. of a remark condemning him by Mark Shields on the PBS Jim Lehrer Report. For Mark Shields to continue spreading Palin's lies about Letterman's joke, saying it was "indefensible," and that Letterman must have been aware he was talking about a 14-year-old was insupportable. 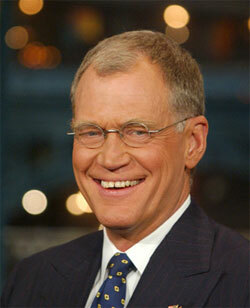 It apparently hit Letterman hard, though, leading to his second apology last night. to pay off the punch line. And his barbs spare almost no one or group. routinely mocks the ethnicity and competence of New York City taxi drivers. Sarah Palin has shamelessly done. at Palin when she deserves it.